Click product for further information. In today's environment you can't take chances with raw material contamination or your workers' safety. 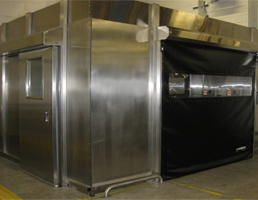 With 20 years of experience, International Portland has set the standard for mobile localized clean air (mini-environments) and containment booths by exceeding customer needs and industry standards - developing Class 1,000-100,000 environments. International Portland's products greatly decrease the risk of product contamination. 1) Protects the surrounding area by providing a clean air sampling area that is negative pressure to the outside. The unit is ideal for sampling of pharmaceutical and nutraceutical raw materials to meet FDA requirements. 2) Built with modular construction and is available in width increments of 3’ and depth increments of 5’. 3) Back wall is constructed with stainless steel and the left & right walls are clear vision polycarbonate and are cavity free for easy wipe down. The containment area ceiling is constructed with a membrane diffuser, with fluorescent lights mounted above. 4) Easy to service with exterior motors and electrical controls. Filter pressure monitors provide advance notice of filter change out necessity. 5) All products are covered by a three-year warranty and are designed to last for the long term and are of high quality construction.